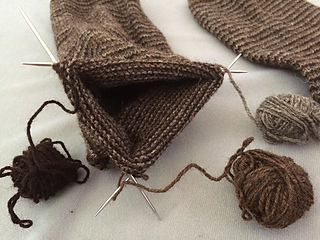 Helix Knitting is an interesting technique involving stripes of single rows, worked circularly. 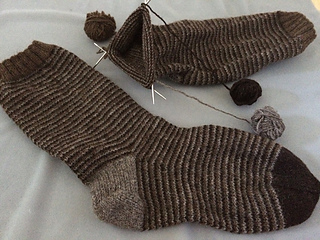 Knitting stripes circularly in the normal manner–one round of one color, then one round of another color– creates a jog, “steps” in the stripes, where they don’t meet up cleanly at the beginning of the round. This disturbs some people and certain techniques have been devised to avoid the jog. 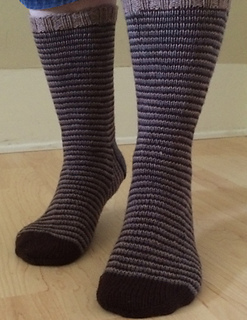 Helix knitting takes a different approach, for each color stripe is on its own path. This is possible because circular knitting is actually a spiral, not a circle, and by staggering the starting point of the different colors used, each color will wind its way around the knitting unimpeded by the other colors. It is an easy technique with just a few details to be adhered to, as is explained in this pattern.